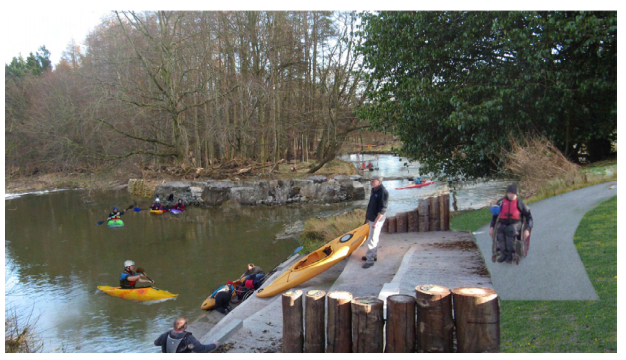 We are a funding body which can provide money to projects which help people get on the water to paddle. The hard work is done by the people who plan and execute the projects, our many thanks to those who have helped our sport. A large tree has become wedged across the parapets of the Dukes Bridge in Chaterelhaut Park just outside Hamilton, South Lanarkshire. The position of this tree poses a significant hazard to any paddler traveling on the river. At the height most paddlers would wish to paddle this section the tree would entrap any paddler coming across it. 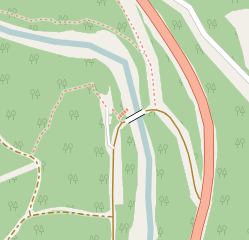 The bridge is just around a blind left hand corner and the tree can only be seen once the the paddler is committed to the line. The tree is too large to be removed easily by paddlers and requires the skill of a professional arborist. South Lanarkshire Council Access officer was contacted to enquire if the authority could remove the tree. They agreed that their arborists could remove it, but that there would be a cost. 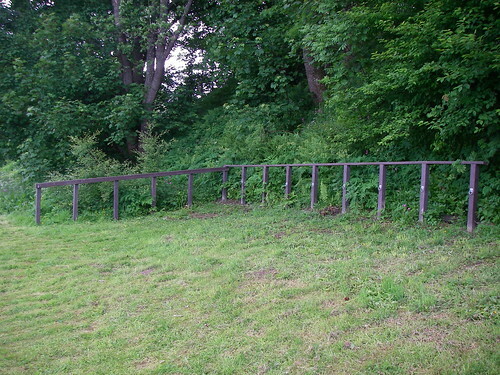 The Access Fund has agreed to pay £600 of the cost jointly with the local council. Grant offer made 11 Feb 2019 for 1 year, currently open. Promoting contributions to SCA Where’s the Water at Wet West Paddlefest. £40 cost. Thanks also to Clive Bowman for carrying out this tricky piece of the work. Also to Mary Conacher for her help in negotiation, and to the landowner, Richard Wilson, for his unfailing courtesy and co-operation. AJ Fund has funded 100% of costs up to £900. 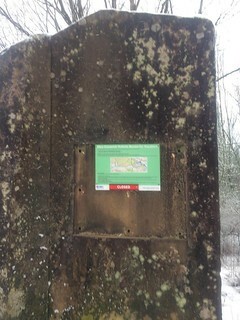 Signs describing car access to private road. We provided £414 for the project. 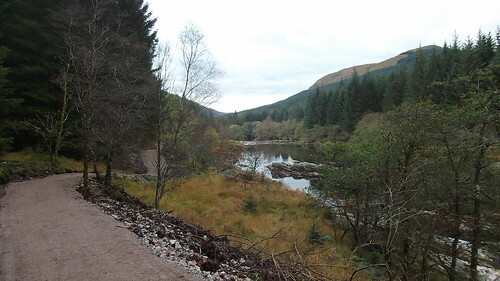 Revived project to build a white water course at the outflow of the Fort William smelter. AJFund has contributed £1200 towards the initial feasibility study and setup of this exciting project. The project was previously attempted in 2009 and the larger than normal grant size from us was because we received the surplus when the 2009 attempt was laid down. 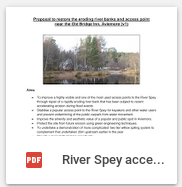 AJ Fund agreed to pay for a Portaloo on River Spey at Ayeon Pool on Ballindalloch estate for 2017 as a one off until more sustainable funding is found. In the end Glenmore Lodge generously pays for the Portaloo and our grant was not needed. 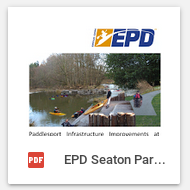 Paddlesport Infrastructure Improvements at Seaton Park, Aberdeen. 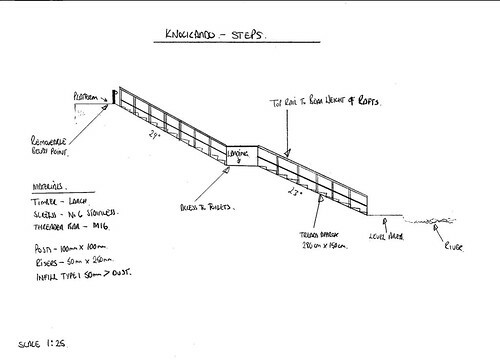 1) Access and Egress points – “Assisted Disabled Access”. 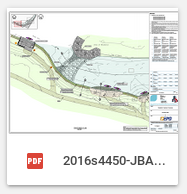 2) Erosion Control – Multi-tiered willow spilling for the loose and eroding bank areas, a harder rock “nose cone” for the head of the island. 3) Improvements to the whitewater environment. Drop structures that will focus the energy and flow available into more appealing and exciting rapids for paddlesport. The AJ Fund granted £1000 towards this worthy project which has now been completed using funding from a number of other sources as well as local fundraising. 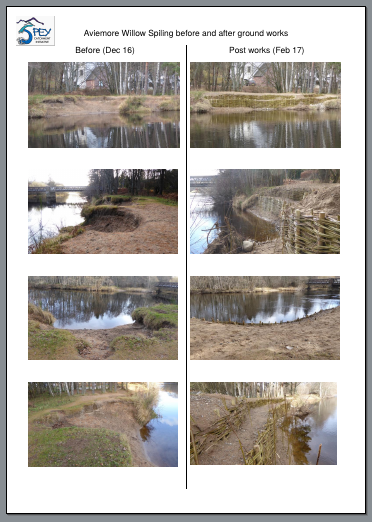 Over the last few years the bankside erosion in the vicinity of the river access point at the Old Bridge Inn carpark, Dalfaber Road, Aviemore, has started to accelerate. A few more large flood events like those experienced last winter and there is a chance of considerable loss of bankside & vegetation along the whole section, changing the characteristics of the area for ever. 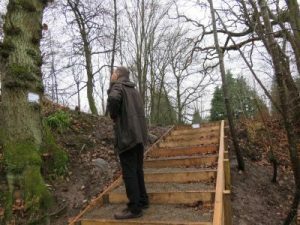 The site is currently a highly visible local beauty spot and popular village amenity, used by locals and visitors alike. 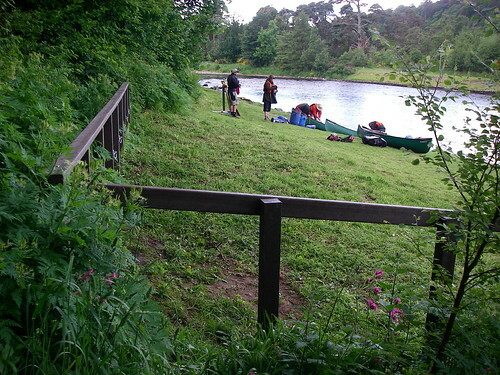 It is one of the main access points to the River Spey and is regularly used by local outdoor access providers as a safe and accessible spot from which beginners can launch kayaks and open boats. 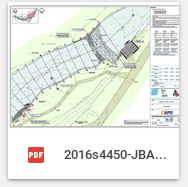 The project is for the construction of sustainable riverbank protection using a two tier willow bank system around the eroded sections of riverbank. The AJ Fund has agreed to contribute £1000. The works are ongoing. Massive thanks to Mary Connacher for all her hard work driving this project. If you would like to donate towards the cost of this project, please go to our My Donate page. 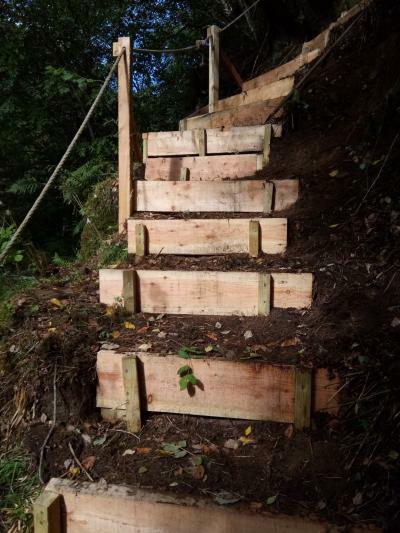 The Andy Jackson Fund for Access was one of the funders of the new footpath at the Eas Urchaidh waterfall on the River Orchy. The total cost of the riverside trail and new car park near the take-out was £148,350 (excluding VAT). The exceptional £5,000 contribution from the Andy Jackson Fund allowed the leverage of other public funds including a SportScotland Grant of £66,537 and a contribution from Forest Enterprise Scotland, who commissioned the work, of £76,313. 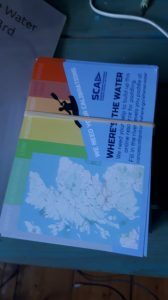 The Scottish Rafting Association contributed £500. 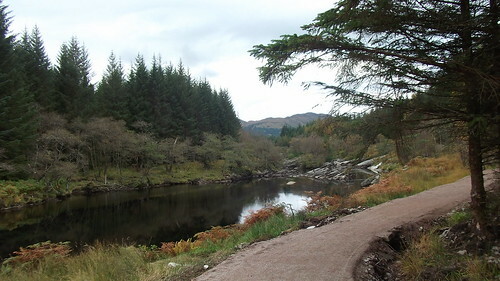 “The Orchy is one of Scotland’s best rivers for white water kayaking and as such attracts enthusiasts from all parts of the UK and from abroad. 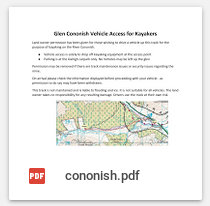 “Most participants have to carry their boats around the difficult Eas a Chathaidh falls. This used to involve wading through deep mud and it was often said that the portage around the falls was as dangerous as descending the falls themselves. Worked with SCA, we provided half the funding at £162.50. 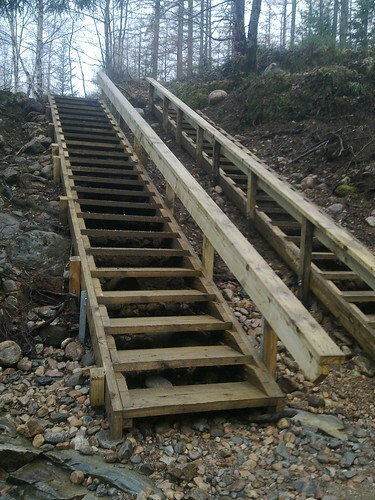 Steps on Garry at one of the popular white water take outs in Scotland and a venue for the Wet West Paddle festival with £500 towards total cost of £4,000+. 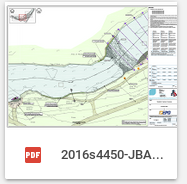 During the year we supported the SCA in preparing a submission to the Land Reform consultation £500. 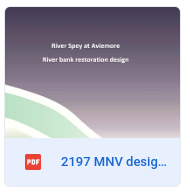 Again on the Spey both with funding and by holding monies for the project. On the Spey, below Aberlour, for parking boats at night safely by the river.